I wouldn't say that. Japan is extremely wealthy, 3rd largest GDP if I remember correctly. Hard to believe that number 5 (U.K) can order 138 B models but number 3 would be lucky to have 40 cheaper A models. Right now the F-35s are there to replace the F-4Js. But it won't be long before they start looking at their F-15Js and decide to replace them. Question is, will they buy more F-35s or would this F-22/35 hybrid look like something worth while to look at. This F-22/35 hybrid won't cut it for 6th gen and PCA will be a lot more capable and longer range than what F-22 can do even with ADVENT. How do you fund a F-22/35 hybrid or even restart just basic F-22 production without taking funds away from PCA? You have 3 options. zero-one wrote: I wouldn't say that. Japan is extremely wealthy, 3rd largest GDP if I remember correctly. Hard to believe that number 5 (U.K) can order 138 B models but number 3 would be lucky to have 40 cheaper A models. Japan would still have to expand there military budget by 10 billion a year to develop a custom F-22/F-35 hybrid. Both the UK and Japan have similar air forces now and overall similar military budgets, the UK is investing a lot in carriers and smaller surface vessels, they need the F-35's as part of that CV investment. The Japanese navy already has the CV's if they choose (but smaller) and a much larger over all Navy(140 vs 70 commissioned ships) to support on the same budget, with plans to grow just about every part of it. If they want to keep there budget the same then straight F-35s are the only option, if they want to grow that budget by 10-15 billion then a custom fighter becomes a option. At this point there is a lot of opposition from there people in expanding the military budget. Japan has openly stated that it will order 100 New Stealth Fighters by the end of 2018. So, clearly that has to be the F-35 as it's the only option. Plus, it's already in production in Japan. I think Japan and Australia would like more of a YF-23/f-35 hybrid. Both countries are disappointed with the range of the f-35. If the stealth and radar are great, then they would not need an agile fighter. They would prefer it to be bigger, faster and with much longer legs the j-20. A stealth interceptor. There is no evidence of that. In fact, the F-35 out-ranges the F-22, ie 740nmi in A2A mode. In A2G mode, the F-35 out-ranges an F-16 with not only EFTs, but CFTs as well. While there may be some in the AU/Japan press/gov that is not happy with the F-35, that opinions not shared with the majority. p33lmybanana wrote: Both countries are disappointed with the range of the f-35. Got some reliable sources for that claim of yours? I have heard conflicting data with regards to f-22 vs f-35 range. If both aircraft have the same armament, which has more range? I understand that the general public is not privy to specifics, however, I read that certain aviation engineers and publications have come close to calculating range based on given variables in the past. Thanks! So, again with the "F-35 as an F-111 replacement" argument. Seriously? I believe the F-35 carries more fuel than the F-22, single engine is typically more efficient than 2. So you can draw what you want from that, but if you want it from the pilots watch this. Go to the 15 min mark. One person's opinion does not a national policy make. zerion wrote: I believe the F-35 carries more fuel than the F-22, single engine is typically more efficient than 2. So you can draw what you want from that, but if you want it from the pilots watch this. Go to the 15 min mark. Thanks for the video. So the pilot states that the f-35 has more range than an f-15C with 2 external tanks. That's impressive. I stand corrected and will take his word for it. lol. I was previously going by what i thought were reputable publications like popular mechanics, national interest and etc. Why were the numbers I've read so far off from what the pilot said? Were the initial figures released just estimates? I definitely will take the pilots word, just wondering what's the best way to research this stuff in the future. Thanks for the video. I will take the pilot's word. He stated that the f-35 has more range than an f-15C with 2 external tanks that he has flown. That's impressive. So almost every source I've read previously stated that the f-35s range was much shorter than the f-22 and f-15. So the Lockheed Martin website has the f-35A range at 1,360 miles. And the Boeing website has the F-15SE at 2,992 miles (they no longer list the C model). The Air Force website has the f-15C/D models at 3,450 miles. Are these of the jet in a clean configuration? I have no idea how much range 2 external tanks add as well. Does that mean that the pilot is stating that f-35A range is greater than 3,500 miles? Does this sound right? If you guys had to give an estimate, what would you say it is? 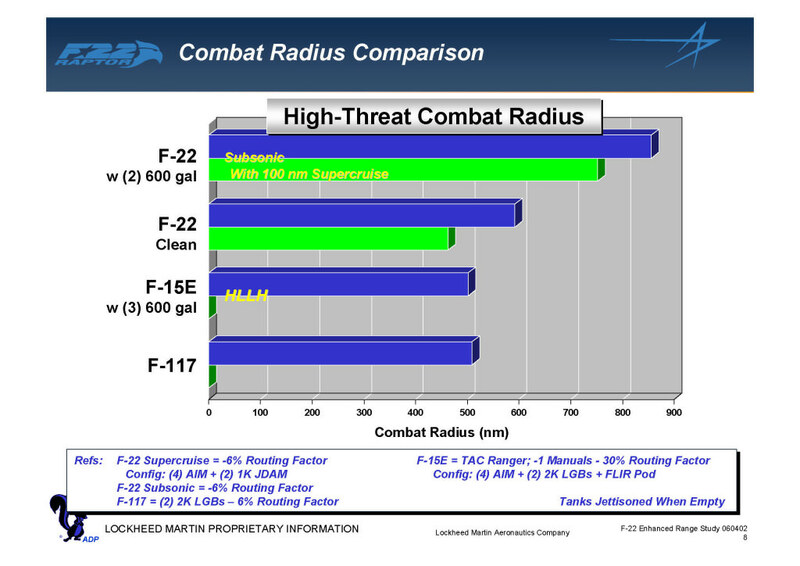 I am not sure what source you are looking at, but the F-35's "combat radius" is much more than the F-22's. Hey Spudman, as stated before. I checked the Lockheed Martin Website for the f-35 range, which directs me to f35.com: which lists it's range at (1200nm). And the Boeing website for f-15, which lists it at 2,600nm. And the pilot stated that the f-35 he flew had as much range as the f-15C that he flew with two external tanks. So is Lockheed severely understating the range? I never mentioned the f-22 range, which the Lockheed Martin website lists at (1600nm). I can't see your image. But are you saying that The Lockheed Martin websites are wrong? It's to my understanding that the actual ranges are classified. Who are the best sources for these type of stats? Where did you get your chart? Are the company websites for clean configurations, and your numbers are different because they are carrying a bomb load for a strike mission? If so, would that change if they were both in A2A configuration?